A back-end software system, the Elsevier Fingerprint Engine mines the text of scientific documents – publication abstracts, funding announcements and awards, project summaries, patents, proposals/applications, and other sources – to create an index of weighted terms which defines the text, known as a Fingerprint visualization. By aggregating and comparing Fingerprint indices, the Elsevier Fingerprint Engine enables institutions to look beyond metadata and expose valuable connections among people, publications, funding opportunities and ideas. The Elsevier Fingerprint Engine powers many solutions including Pure, comprehensive information management system, and Expert Lookup, an Elsevier tool for finding reviewers. The Elsevier Fingerprint Engine uses a variety of thesauri to support applications pertaining to different subject areas. By applying a wide range of thesauri, Elsevier can develop solutions for researchers in but not limited to: the life sciences, engineering, earth and environmental sciences, arts and humanities, social sciences, mathematics and agriculture. The Elsevier Fingerprint Engine creates an index of weighted terms that defines the text, known as a Fingerprint index. By aggregating and comparing Fingerprint indices of people, publications, funding opportunities and ideas, the Elsevier Fingerprint Engine reveals insightful connections with practical applications. Here are some examples of how Fingerprint indices can bring scholarly business intelligence to your data. Pure aggregates the Fingerprint indices of individual documents to create unique Fingerprint indices that reveal your researchers’ distinctive expertise. In mid 2014 Pure will match the Fingerprint indices of funding opportunities in SciVal® Funding to your researchers’ Fingerprint indices, recommending appropriate funding opportunities and suggested collaborators. Expert Lookup compares document Fingerprint indices with researcher Fingerprint indices, making it easier to identify reviewers and raise awareness about potential conflicts of interest. Elsevier Journal Finder helps researchers find journals that could be best suited for publishing their articles. 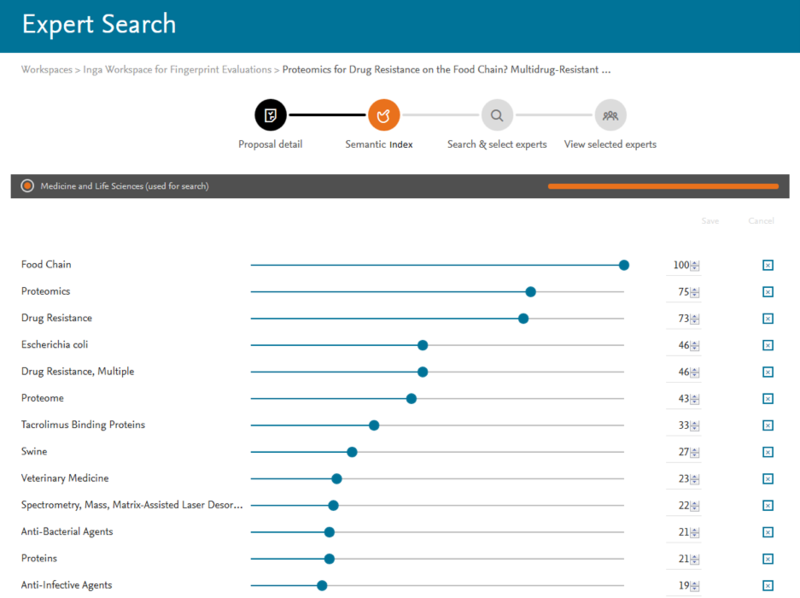 Journal Finder matches abstracts to Elsevier journals, scanning Elsevier 2,200+ titles in the Health Sciences, Life Sciences, Physical Sciences and Social Sciences.